On Wednesday, September 16, former Vassar faculty member and social justice icon Angela Davis spoke at Vassar College. Students, faculty, and community members crowded Vassar’s Chapel to hear Davis honor and commemorate the 30th anniversary of the Women’s Studies Program. A native of Alabama, Davis rose to national prominence as a political activist and a leader of the Communist Party USA. In 1970, she was falsely incriminated in an armed takeover of a Marin County courtroom that culminated in the death of four men, including Superior Court judge Harold Haley. 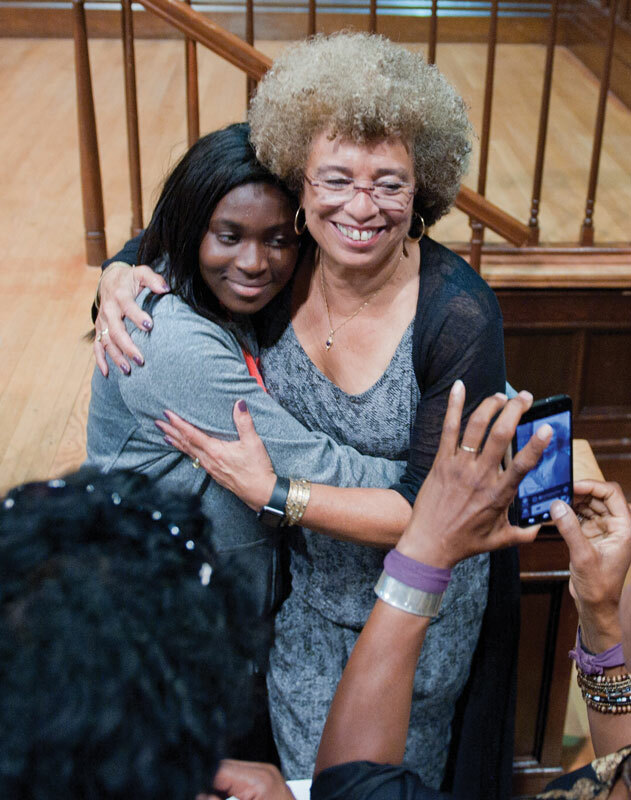 Her arrest and subsequent incarceration catalyzed a national movement to liberate Davis. Later, she was fully acquitted of these crimes and continued her career of teaching, activism, and writing, becoming one of the premier figures in the black feminist movement and related campaigns. One of these endeavors included teaching philosophy and Women’s Studies at Vassar in 1995. Professor Emeritus of English Barbara Page, cofounder and former director of the Women’s Studies Program, echoed these sentiments. Professor Page noted Davis’s relentless opposition to the “prison-industrial complex.” She also recounted a few of Davis’s life experiences—including her upbringing in Birmingham, Alabama, where three of her family’s friends were killed in the infamous Birmingham church bombing, and Davis’s education at Brandeis University under the legendary Herbert Marcuse, a German-American philosopher, sociologist, and political theorist. Taking the stage, Davis reminisced about her time as a faculty member at Vassar and offered a special thanks to Professor of Sociology Diane Harriford, who convinced her to teach at the college. During her speech, Davis elaborated on the intersectionality of issues addressed by those who fight for civil rights, LGBTQ equality, and an end to class oppression—movements she said were all influenced by black feminism. "We are actively committed to struggling against racial, sexual, heterosexual, and class oppression, and see as our particular task the development of integrated analysis and practice based upon the fact that the major systems of oppression are interlocking." Modern rights movements owe much to this tradition, Davis said. Two such movements are Occupy Wall Street and Black Lives Matter, frequently criticized for their apparent lack of leadership. Looking for modes of traditional leadership, the public asks, “Where are the leaders? What are the demands?” but Davis observed that these movements are employing less hierarchical models espoused by the black feminist movement. While the public might view Occupy Wall Street and Black Lives Matter as ineffectual, she argued, “Impact cannot be equated with outcome.” These groups have greatly changed public discourse, she argued. “Leadership is not a male prerogative,” she contended. “If racial hierarchies need to be overturned, so do gender hierarchies.” Besides, black women have always done the work of organizing protests, she added, pointing to the Montgomery Bus Boycott as an example. 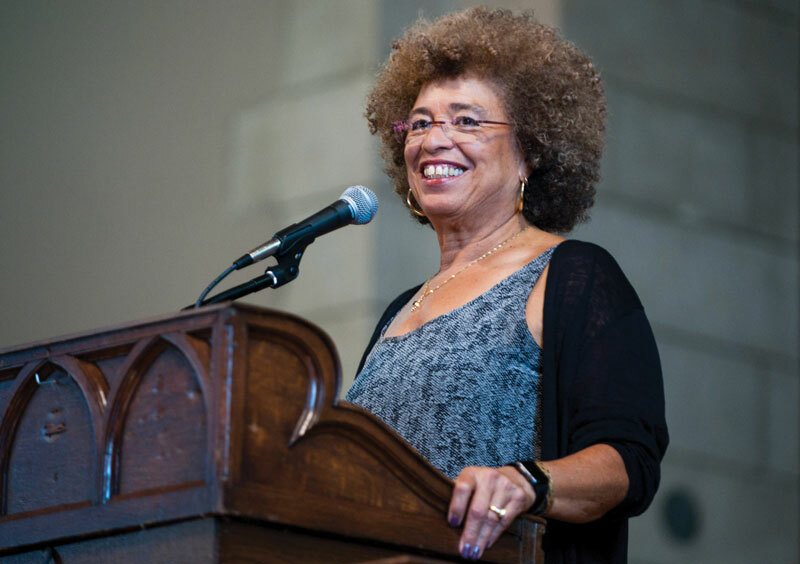 In her speech, Davis also took on the “tyranny of the universal,” in particular universalist claims by critics of the Black Lives Matter movement. Davis argued that when detractors counter with “All Lives Matter,” they ignore the specific targets of police brutality and the pervasive racism against black men and women that fly in the face of this claim and obscure the complex issue of systematic oppression in American society. Racism, she acknowledged, is an issue that goes far beyond the borders of the United States. It is a “global phenomenon” that can be seen in many challenges that face us today—from the refugee crisis in Europe to growing Islamaphobia and anti-Semitism around the globe, she said. Feminism and women’s studies, she argued, provide an intersectional analysis of the systems that support these ills.